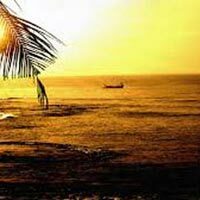 08:30 AM Coach leaves for the must-see sights of South Goa built into the itinerary themed to entertain popular interests. 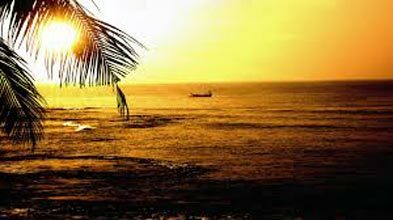 Also lovingly called the ‘lover paradise’, this estuary overlooks the Goa port city – Vasco –da-Gama. The place has a tragic history – of an unrequited love story between Portuguese Viceroy’s daughter and a fisherman from Goa. Dona Paula the daughter of the Viceroy Paula Amaral Antonio de Souto Maior gave up her life when the Viceroy refused to accept the match. She flung from the cliff jumping into the Arabian Sea. Therefore, to pay an eternal tribute, the Viceroy decided to name the area Dona Paula. Couples do come and visit the waterfront of Dona Paula. The 2 km long beach, also known as ‘Gasper Dias’, is lined with beautiful swaying Pine trees and its easy accessibility with only 3 kms distance from the capital it is a popular tourist destination. It owes its sparkly name to silvery sand bed and offers a magnificent and grand view of the Aguada fort. It fills you with tranquillity and solitude with its scenic landscape. Goa is famous for its quaint, archaic, traditional Portuguese architecturally structured churches. The mortal remains of St. Francis Xavier – the patron Saint of Goa can be visited at the the Basilica of Bom Jesus. Another popular destination is the Se Cathedral, which is the largest church in Asia. This beautiful church is a UNESCO World Heritage Site and is one of the oldest churches of Goa. Goa had seen the development of Baroque architectural construction in the late 16th century and this breath-taking beautiful church is cited as an exemplary structure for this specific building style. A silver casket shelters the body of St Francis Xavier in a mausoleum at the top. In the 17th century, Giovanni Battista a sculptor designed this mausoleum. For the historical enthusiasts, the Bom Jesus Basilica Art Gallery has a stunning art gallery, exhibiting the works of Dom Martin, a Goan painter. Afonso, a Portuguese ruler, in 1510 captured a Goan city and to celebrate this victory, he built this church. It is one of the largest church in India and dedicated the cathedral to Saint Catherine, as it was also the day of her feat. Beautifully structured in the stunning and regal Portuguese- Manueline architectural style, the Se Cathedral has Corinthian style interiors and the exteriors impress with their perfect Tuscan style architecture. The history and art lovers are enthused with the numerous ancient paintings made in dedication to Catherine of Alexandria, and these are especially posited in the altar. Bhagavan Manguesh, an incarnation of Lord Shiva and this exquisite 400-year-old temple is dedicated to him. This beautifully intricate, simple, well designed and elegant structure has interesting seven-storeyed lamp tower or deepstambha stands, posited in the temple complex. A tranquil and calm water body, which is said to be the oldest section of the temple soothes the senses and builds religious value. Every Goan revers this most famous temple of Goa. It is a must visit for every Hindu in Goa and is venerated and worshipped by the Goans as a whole. The beautiful deity of Shantadurga fills one with awe and respect and has an imposing presence with the serpents in each hand, representing Vishnu and Shiva. River Mandovi with its beautiful cruise makes for an adventurous cruise with a spectacular performance by the traditional Goan and Portuguese dances performers. The tourists are filled with enthusiastic thrill as the live musicians take the stage and tune in some scintillating music. The riveting festive ambiance showcase the Goan hospitality in its full splendour for the guests. A warm and friendly compere welcomes the guests on board and provide interesting details of well-known landmarks on the shore. The cruise is all about fun and program is designed such that it sets a mood for one and all to simply live, love and laugh. 07:30 PM Coach reaches back the meeting point.